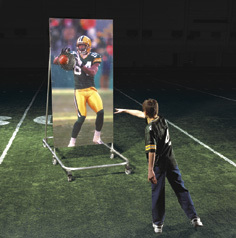 The RECEIVER TARGET is used on Game Day to set up an Interactive Fan Experience. It’s fun and it promotes the skill of throwing the football. Use it to set up a Quarterback Challenge for kids and adults. A passing contest gives sponsors an opportunity to promote products and award prizes. Use it during pre-game or half-time promotions. The picture depicts a Receiver with outstretched hands ready to catch a pass. The object is to throw the ball and hit the bullseye. A drop pocket catches the ball. The picture is 4' wide and 8' high and is fastened to a sturdy aluminum frame. The frame is mounted on solid 8" wheels for ease in movement. The picture is covered with a clear Lexan shield to protect it from the pounding of errant throws. Customer must supply a digital art file with player image.